"The Terms are Clear. Kill or be Killed." Silent Trigger, originally written and produced with the title The Algonquin Goodbye, is about two former hitmen who are sent on identical separate missions by the same secret unidentified agency to assassinate a target from a hidden location in the city. 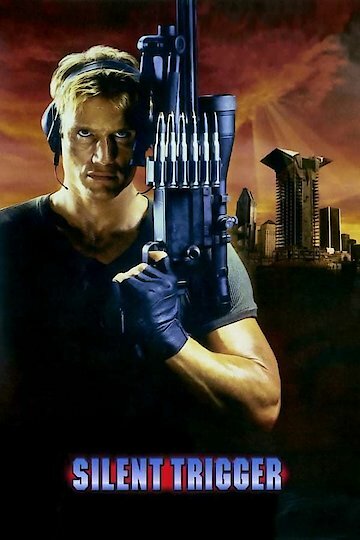 Silent Trigger stars Dolph Lundgren as a sniper named Waxman. Gina Bellman also stars as his female spotter named Clegg. Waxman and Clegg are working independently, but, by either plotting by the Agency or by coincidence, they have both ended up in the same location to work on their independent assignments. Both Waxman and Clegg climb independently to the top of an unfinished skyscraper in an unnamed city, and before either begin to set up their shooting platforms, they spot each other. They immediately recognize each other, because they were partners on an assignment together years before. The details of Waxman and Clegg’s previous assignment are revealed in flashbacks. On their previous assignment, Waxman and Clegg were sent to assassinate a female politician. Waxman hesitates to shoot the politician when she lifts a child in her arms. In that brief moment of hesitation, a helicopter from the US army strikes down on them with air-assaulting soldiers firing machine guns at them. Together with Clegg, Waxman is able to shoot the pilot and copilot through the canopy and just barely escapes the rounds of fire alive before they both run away. Despite the tension between them from this incident, an undeniable but unspoken attraction between Waxman and Clegg allows them to forget the past temporarily, and they decide to work on their new assignment together. They set up a shared shooting platform, with Waxman as the main sniper and Clegg as the spotter. Before they achieve success and hit the target, they must endure a tense night together, filled with moral and physical obstacles, like nosey security guards, flying bombs, and battling soldiers. Silent Trigger was directed by Russell Mulcahy, who is most famous for his film Highlander. Silent Trigger is currently available to watch free on Tubi TV and stream, download, buy on demand at Amazon Prime, Amazon online.